Accessorizing is usually one of the most fun and least stressful elements to decorating, but that can all go out the window when it comes time to accessorize an extremely small room. Trying to add lighting, textures, colors and patterns in such a small space can be difficult. Keep these three tricks in mind next time you are set to decorate an exceptionally small space. 1. Accessorize from different heights – To accessorize from different heights, try adding in a small chandelier or mini pendants to the space. Hanging lights are great for small spaces because they draw the eye upwards, while adding light and not taking up valuable surface space. 2. Less is more – Interior design can be tricky, but when it comes to small spaces remember that less really is more. Instead of piling the room full of small knick-knacks and accessories, find a few pieces that will make a statement, without looking cluttered. Candles, wall art and plants (real or fake) are all great accessories that look more purposeful than simply decorative. When in doubt, add a mirror to your small room. Mirrors create visual interest and make the room look and feel much larger than it is. 3. Group in odds – Grouping in odds is important no matter what size room; however it is even more important in small rooms. 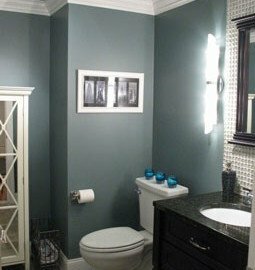 For example, if you’re decorating a small bathroom try adding a small chandelier, three candles grouped together and one small green plant in the corner of the vanity. This décor will draw the eye up and around, without cluttering the room! Your small and once dreadful room to decorate and accessorize may quite possibly become your favorite space in the house. Small rooms are a great place to be creative and have fun with accessories. Accessorizing shouldn’t be a dread – instead it should be something you look forward to doing. And the best part of all – small rooms don’t require a lot of pieces so you can redecorate as often as you want without feeling guilty and wasteful. .A few new candles, a new lighting fixture or new rug can make a big impact, and change the whole look and feel of the room.